We have teamed up with two developers and their banks this month and are now able to offer some truly spectacular deals on properties in Spain. The biggest bonus for British investors is the deposit level on both resorts is zero, and on one deal you don’t even need all of your taxes! Yes, we have 100% and 112% mortgages on certain properties. These stunning 2 bed apartments were priced in February between 175.000 and 190.000 euros. Now you can buy one (or more!) for an incredible 95.000 euros direct from the builder, Polaris World. The resort is scheduled to be finished in May and to make things even better you can have a 100% mortgage! Think about it, in February you would have needed a 40% deposit plus your purchase costs meaning you would have needed to find nearly 90.000 euros. On this special promotion you need only fund your taxes and closing costs which will be approx £9,000. The mortgage is available at a competitive 2.75% in the 1st year meaning a payment each month of just 387 euros. The mortgage is reviewed every year and the interest fixed 1.5% above the 12 month Euribor rate, which is currently approx 1.25%. Situated on Las Terrazas de La Torre, this resort will be the last part of the much vaunted Nicklaus Golf Trail. Just a short drive from the Mar Menor and Mediterranean beaches, and located within easy access of the Airports of Alicante, San Javier and the soon to open Corvera, these properties will surely be spectacular value. The offer is limited so contact us now. 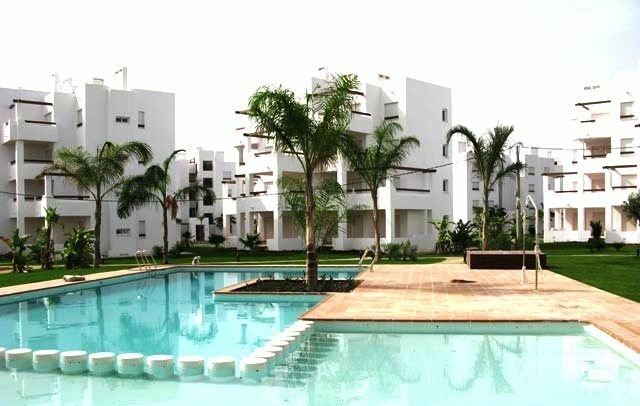 Residencial Alta Entinas, Almerimar, Almeria from 485 euros per month. You may choose from two simply incredible deals. Option 1. Move in for less than 3.000 euros. Yes that’s right, you can have a mortgage which is 100% PLUS your taxes and costs. You simply pay a 3.000 holding deposit and that’s it! In many cases, once you have taken over the builders mortgage there may even be 1.000 or 1.500 left in your account to help furnish it! Each deal will be discussed in detail with you to maximize the cash left if you so wish. Option 2. Have a 3 year mortgage free period! Simply pay a 10% deposit plus your taxes and closing costs and have a mortgage holiday of up to 3 years! That’s right, nothing to pay, no interest being added, simply a suspension of all activity on your mortgage account for up to 3 years! Think how much that could save you! Let’s look at the figures on both deals. Take a 1 bed apartment at just 120.000 euros. You reserve it for 3.000 euros and then you need to make a choice. You put no more money in, take over the builders mortgage of approx 133.000 euros and get your keys. Your mortgage payments would then be approx 600 euros per month on a 25 years mortgage. The resort of Almerimar is fast becoming a hotspot in Almeria. Designed to provide an alternative to Puerto Banus, but on an affordable budget, these apartments were previously for sale for up to 200.000 euros, so these prices and mortgage deals are simply incredible. * All prices quoted are valid at the time of publication (4/01/2011) and all mortgages are subject to status. We have a limited number of new 2 bedroom PENTHOUSE front line BRAND NEW key ready apartments on 5 star golf resort with 100% mortgages available for fast buyers, served on a strictly first come first served basis – when first released these were from 171-194000 euros, this is an amazing opportunity call us. The resort is a project which combines all the experience gained by the premier developer in the region during the creation of their five previous resorts. It is guaranteed to provide a unique experience of total enjoyment and quality of life. Located on an area measuring 1,555,129 m2, including space for a large lake which will be used for outdoor leisure pursuits within the resort. The resort will offer its residents and visitors top quality services in a town centre featuring everything needed to make life much more comfortable: bars, restaurants, club house, golf pro-shop and a supermarket with home delivery service, etc. A neighbouring resort is only a couple of kilometres away, so the services are further complemented by all those available in this resort: a 5-star hotel, bars, restaurants, bank, etc. Its golf course, designed by Nicklaus Design, comprises 18 desert-style holes. Its characteristics are based on the very oldest links-style courses in the British Isles. For details of any of these offers please click here.